One of my students this year has Celiac’s Disease, so she can’t eat or be around products that have gluten. That rules Play Dough right out. 1. You can buy gluten-free dough, but it’s horribly expensive. 2. You can make your own, but I carry a certain play-dough curse that prevents that option. 3. There’s some stuff called Play Foam or something like that, and that looks kinda cool. It’s foam beads suspended in goo and supposedly it doesn’t dry out. I’ll be trying that. 4. Moon Sand, but I hear it’s awful. I was looking for the foam stuff at Wal-Mart tonight, but they didn’t have it. However, they did have Moon Dough, so I brought it home for a test run. Dumped out of the bag, it looked so dry. Upon picking it up, it is crazy light. Almost cotton-candy-light. It is strangely crumbly. You squish it and it sticks together, but bits of it squish away and crumble off the big lump. It feels neat to hold, but so many bits to pick up make this a deal breaker. Plus, my hands felt weird afterward. 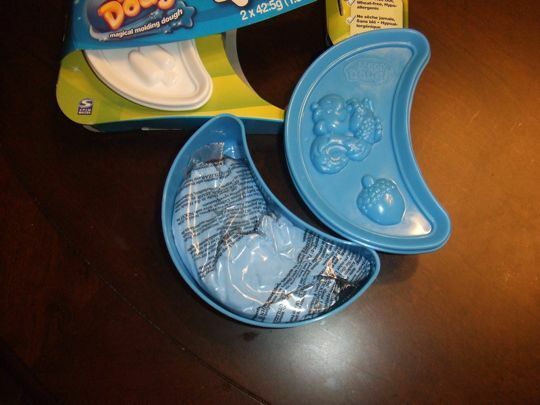 So: Final review – you have failed to wow, Moon Dough. 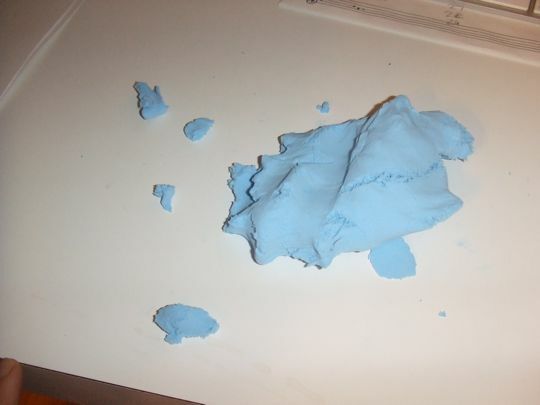 UPDATE: I have wound up making a couple of batches of buckwheat play dough that have worked out well, and just bought some of this foam dough from Discount School Supply, and it is a big hit with the kids! I’ve always wanted to play with Moon Sand, but never bought any. I should just get some. It’s not a dough-like product, but that artificial sand they have at Menard’s is super cool. Declan got some for Christmas last year…..he LOVES it! It’s a little messy, but has a little inflatable tray that seems to keep it contained. It is fun to play with! I’ve always wanted to try Moon Sand too…let us know how that works. 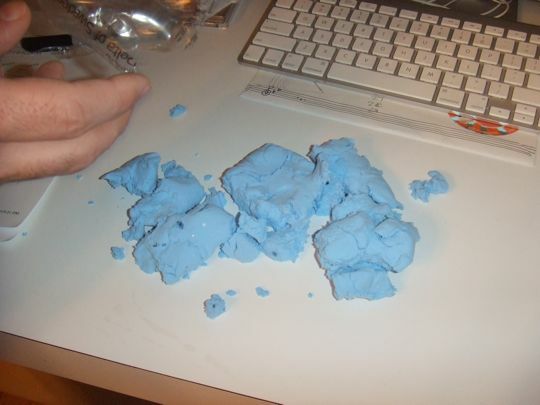 I used to make playdough with my kids. I think I remember it turning out …except when they would add the coloring…a few drops of every color does not make a rainbow…it makes brown. How about mud pies? That should be gluten free, unless someone has accidently spilled flour in the dirt. When Brittney was about 5 we had a friend of hers come over to play….they did a bunch of stuff that day, but when the little girl’s mom came to pick her up we were playing at the kitchen table with play dough. The mom seemed surprised and told us that play dough was only allowed as an “outside” play item at their house. I found that very strange considering it would dry out in the sun…..I guess their house was kept much tidier than mine! Would buckwhear flour work for play dough?